IOWA CITY,IA— Michael Lensing was looking ahead in 1978 when he and Vicki Lensing acquired one of the oldest funeral homes in Iowa City. At the time it was known as Donohue Mortuary and located on Linn Street where the Lensings continued to serve families. 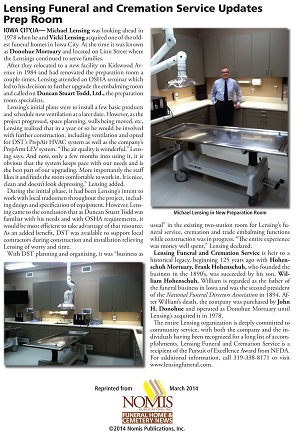 After they relocated to a new facility on Kirkwood Avenue in 1984 and had renovated the preparation room a couple times, Lensing attended an OSHA seminar which led to his decision to further upgrade the embalming room and called on Duncan Stuart Todd, Ltd., the preparation room specialists. Lensing’s initial plans were to install a few basic products and schedule new ventilation at a later date. However, as theproject progressed, space planning, walls being moved, etc, Lensing realized that in a year or so he would be involved with further construction, including ventilation and opted for DST’s PrepAir HVAC system as well as the company’s PrepArm LEV system. “The air quality is wonderful,” Lensing says. And now, only a few months into using it, it is obvious that the system keeps pace with our needs and is the best part of our upgrading. More importantly the staff likes it and finds the room comfortable to work in. It is nice, clean and doesn’t look depressing,” Lensing added. During the initial phase, it had been Lensing’s intent to work with local tradesmen throughout the project, including design and specification of equipment. However, Lensing came to the conclusion that as Duncan Stuart Todd was familiar with his needs and with OSHA requirements, it would be most efficient to take advantage of that resource. As an added benefit, DST was available to support local contractors during construction and installation relieving Lensing of worry and time. With DST planning and organizing, it was “business as usual” in the existing two-station room for Lensing’s funeral service, cremation and trade embalming functions while construction was in progress. “The entire experience was money well spent,” Lensing declared. Lensing Funeral and Cremation Service is heir to a historical legacy, beginning 125 years ago with Hohenschuh Mortuary. Frank Hohenschuh, who founded the business in the 1890’s, was succeeded by his son, William Hohenschuh. William is regarded as the father of the funeral business in Iowa and was the second president of the National Funeral Directors Association in 1894. After William’s death, the company was purchased by John H. Donohue and operated as Donohue Mortuary until Lensing’s acquired it in 1978.